Automate conveyor transfers for large, heavy loads with a chain driven transfer. The chain drive brings the load onto the transfer carriage where powered rollers rise to engage and move the load forward off the transfer carriage. The model DCEZ-63 is a 3-strand drag chain pallet-handling conveyor. With EZLogic accumulation module, pallets are accumulated with zero-back pressure reducing the possibility of collision that may result in product damage. Models 25/26-CRRC & 25 CRRCT are commonly used in conjunction with the 25/26-CRR conveyor to carry heavy unit loads such as pallets and drums. 25 CRRT is a tapered roller curve, while 25/26 CRRC are straight roller conveyors. The heavy design of the 26-CRR allows it to be used for conveying higher load capabilities such as loaded pallets and drums. Chain driven rollers make it ideal for conveying oily parts in bottling and steel industries. A chain-driven, live-roller, zero-pressure accumulation conveyor that handles cartons or pallets in conditions not suitable for belt driven rollers. Items are accumulated with Zero Back Pressure reducing the possibility of collisions that may result in product damage. The Model 25-LREZ is a belt driven live roller conveyor designed for use where zero-pressure accumulation, low elevation (12"), and close roller centers are required. It's a heavy duty accumulation conveyor for palletized loads. A chain driven live (2.5") roller conveyor that handles loads such as pallets, drums, etc. Items are accumulated with zero back pressure. Model DCEZ is a drag chain conveyor designed to handle pallets. With the EZLogic accumulation module, pallets are accumulated with zero-back pressure reducing the possibility of collision that may result in product damage. 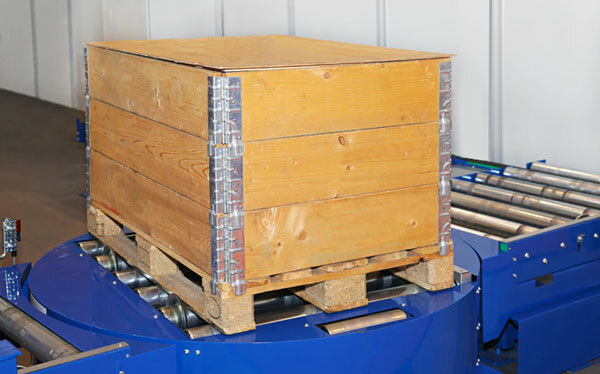 A chain-driven live roller conveyor (3.5" diameter rollers) that handles large, heavy loads such as pallets and drums. Items are accumulated with zero back pressure, reducing the possibility of collisions that may result in product damage.